Great professional service from Steve and staff. I will always remember Steve moving items out of my garage 2 hours before closing. Very intense situation but Steve was there for us. Highly recommend. A week after our Lithia Springs sale began and even now I am amazed at the job Lott’s did. In preparation, every time they pulled something out there was more found…our Mother was truly a “collector” with a “good eye”. It was overwhelming the amount of “treasures” even we children found. I would highly recommend Lott’s to anyone, they were tireless in their efforts to make this a successful sale, and it truly was. During the sale they were constantly, tirelessly working with customers, pulling out more things to fill in an empty area where something had already sold, carefully packing purchases, and keeping us apprised of the progress. These folks are compassionate, caring, AND very professional and open to doing all that is necessary to make a sale be the best it can be. Steve, Don, and staff….you all rock for sure!!! THANK YOU!! 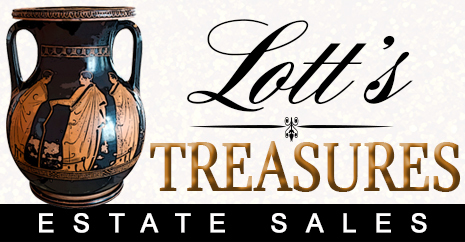 Lott’s treasures was truly a life saver when it came to handling my aunt’s estate. I can’t thank them enough, and I highly recommend them to anyone who faces a similar situation. They are the best! After my mom died I was pretty overwhelmed. My mom had a 6000 SQ ft home that was packed full of a lifetime of belongings that I couldn’t possibly hold on to. Especially since I live in a 1 bedroom apartment in Chicago. My wife found Lott’s Treasures when we were were googling trying to find experienced trustworthy people who could manage an estate sale without us having to be there. When Steve came to first see my mom’s house he was incredibly warm and seemed very capable. After speaking with him and reviewing the contract we decided to go with his company over the other companies we interviewed. The percentage he charged was more expensive than some of the others (40%) but that made sense based off of how large my mom’s house was, how much stuff she had, and how many people he’d need to staff the house for the three day sale. It evened out since the proceeds from the sale far exceeded what we were expecting which was a nice surprise. I think that’s all down to their professionalism and their great advertising. Also, they carefully went through my mom’s belongings and found some personal items that I must have missed and they made sure to keep those items separate and box them up for me. I’d absolutely recommend them to anyone needing estate sale services! I had an excellent experience working with the Lott’s Treasure crew. They handled an estate sale for one of my properties. They are very punctual, trustworthy and knowledgeable. I would definitely recommend them as the best estate sale company in Greater Atlanta.